Loh bak is a Hokkien dish from Penang that's traditionally eaten at festive occasions like Chinese New Year. 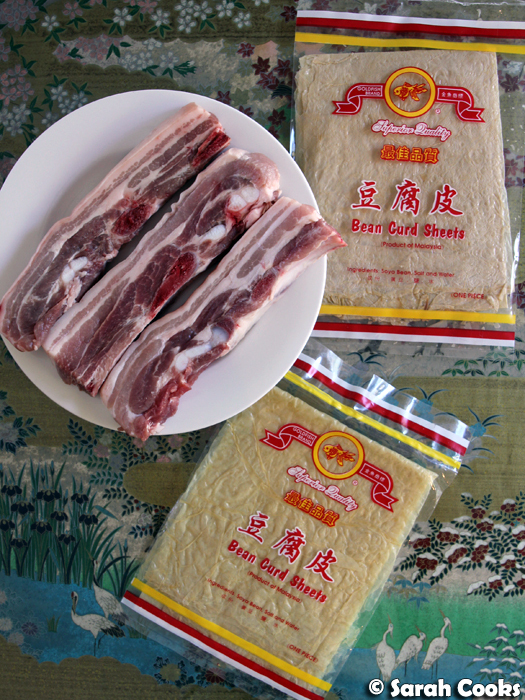 Pork belly is chopped into small pieces and mixed with five-spice powder, before being wrapped in bean curd skin and deep fried. They're crisp and juicy and tasty and totally compulsive! This is an absolute family favourite and I'm so excited to be sharing the recipe with you. My mum makes the best loh bak. Fact. She always makes it at Chinese New Year, and often throughout the year when we request it. She got the recipe from an auntie many years ago (before my brother and I were born, probably), and she still has the recipe typed up on a little card that she keeps in a box in the pantry. Of course, she's made this so many times that she doesn't actually use the recipe any more! As with most recipes from a Malaysian auntie, the instructions are quite vague, and assume a lot of existing knowledge. Fret not, dear readers, I have written the recipe below in a way that (I hope) is a bit more instructive! Feel free to comment if anything is unclear and I will attempt to explain in more detail! The recipe below is the way my mum makes it - I'm not sure how much is from Aunty Oh Nya Ee, and how much is from my mum. I guess that's what happens when recipes are passed along. My mum and I made this batch together for our Chinese New Year celebration this year, with Sandra photographing (and taste testing). It's technically still the Chinese New Year period until Tuesday the 19th of February (chap goh meh or the "fifteenth night"), so you could definitely make a batch before then! Or just make it any time! It's that good. So, the two main ingredients are pork belly (or "belly pork" as my Malaysian relatives call it), and bean curd sheets. You can buy the bean curd sheets at Asian grocers. My mum uses this brand; an important thing is to make sure you buy sheets that are flexible and not brittle, as you'll be rolling them up later. (I've seen both types in the stores). For the belly pork, my mum usually picks a piece at the butcher that "looks right", which I estimate is around the 1.5 kilogram mark. This year, she bought a few pieces already sliced into rashers, which made the chopping process a lot easier. She says she'll do this again next time! (PS the pork in the picture below is about half of what we used that day). With the belly pork, you need to chop off the rind, and chop out any bones. Then you slice and slice and slice into small pieces, like the ones below. This is quite a bit of work; a sharp knife is essential. Whatever you do, don't use minced pork, Mum says "that's cheating", and it won't taste as good. (I must add here that as an angsty teen I refused to eat pork, and during that period my mum kindly made loh bak with minced chicken every Chinese New Year! She also used to make bak kwa with minced chicken for me during that time. I remember her complaining about it a lot, but the fact that she was kind enough to make something different to accommodate me really demonstrates true maternal love). Then you mix the pork pieces with some five spice powder, an egg, some pepper, and a little soy sauce. I've estimated about one teaspoon; when I asked my mum for a quantity she just poured it in freestyle and said: "liddat liddat lah". So, then you set up your work station! We have the pork mixture, a mix of cornflour and water to help seal the edges, the beancurd sheets, and a damp clean cloth. 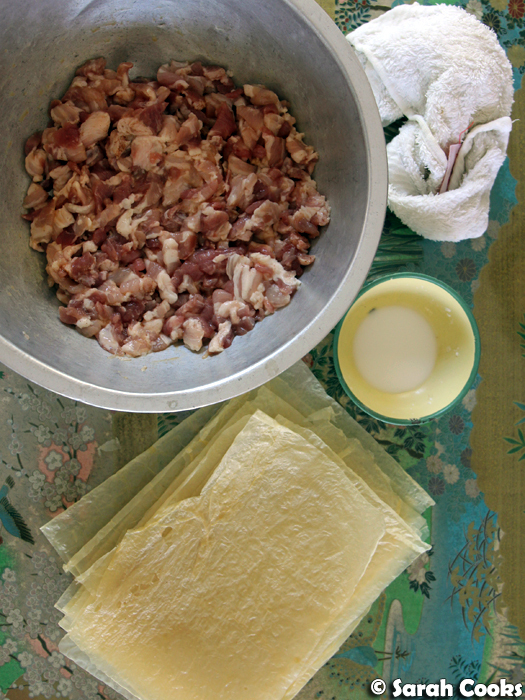 The beancurd skin comes in one big sheet and is folded to fit into the packet; you simply cut them along the folds. 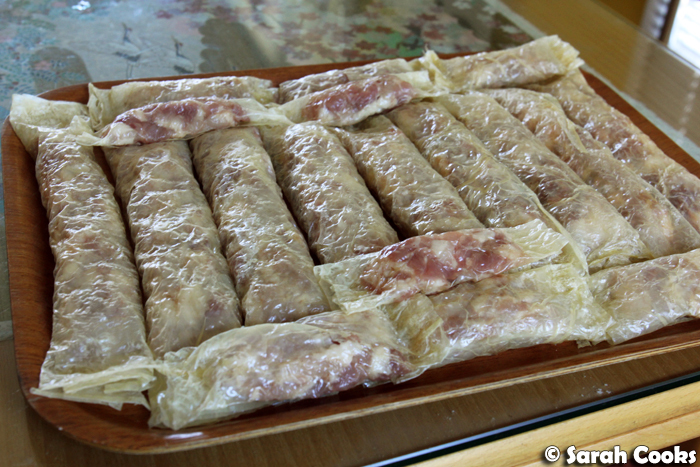 The damp cloth is to wipe the beancurd skin pieces on each side before you add the filling. I don't think this is strictly necessary, but my mum says you gotta do it because you never know if the beancurd factory is dusty or not, so I go with what she says. You lay some of the pork mince on the beancurd skin (as per the below picture), then dab the short edges with some cornflour mixture, then roll it up! You also dab some cornflour mixture on the long side furthest away from you to help seal it down. And to finish, you gotta press the edges down! You place the roll on a tray (seam side down so it doesn't unroll), and then keep rolling until you're all out of meat. We often have a few pieces of beancurd skin leftover; it really depends on how big your piece of pork was, and how generously you fill the rolls. My one small contribution to the culinary tradition of loh bak is to make some rolls extra small. (About half a sheet). This means you get extra crunchy edges, which are the best part! (It's taken twelve years of Sandra stealing the crunchy end pieces at family dinners for me to come up with this innovation, but better late than never). At this point you can either proceed straight to deep-frying, or cover the tray loosely with clingfilm and refrigerate for a few hours, or overnight, until you want to fry. (My mum often freezes logs of loh bak too, and fries them directly from frozen). So crunchy. So juicy. So delicious! We serve them with cucumber pieces, and a dipping sauce made of equal parts tomato ketchup and Lingham's original chilli sauce with some toasted sesame seeds stirred through. 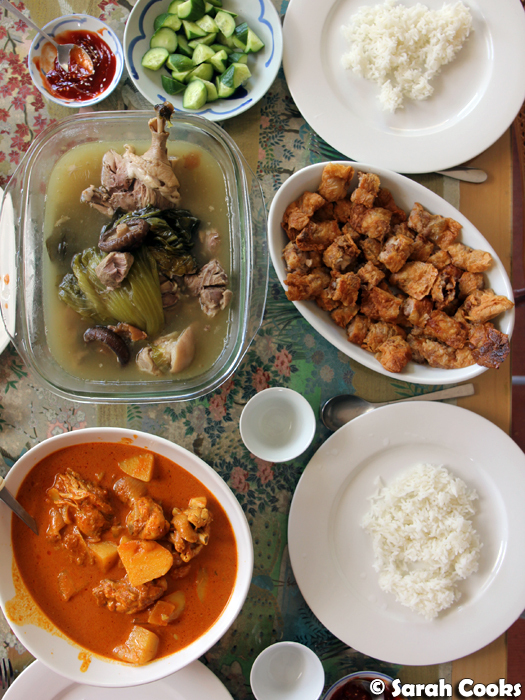 As I've told you practically every Chinese New Year for the last fourteen years, my family's Chinese New Year dinner is always the same - loh bak, curry chicken kapitan, and kiam chye thng (salted vegetable soup with duck and pig's trotter). So good! Happy happy Chinese new year! I hope the Year of the Pig brings you lots of joy and success! (And hopefully a few servings of loh bak). Cut the rind off the pork belly. Slice the pork belly into thick strips, and then cut the thick strips into thin little pieces. 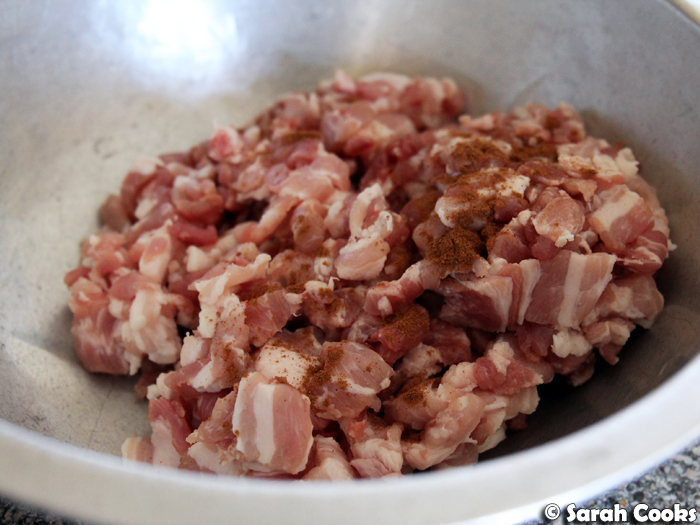 Place the pork belly pieces into a large mixing bowl. Add the egg, 5-spice powder, pepper and soy sauce. Stir to combine. Remove the bean curd sheet from the packet, and cut into rectangles. Each packet contains one large sheet of beancurd folded up, you can just cut along the seams. Cut some of these sheets in half again if you want to make mini rolls and thus increase the amount of crunchy ends. Mix the cornflour with 2 tablespoons of water to form a white liquid. Set up the bowl of seasoned pork, the sheets of bean curd, and the cornflour water on your work surface. Take one sheet of bean curd skin, and wipe it on both sides with a clean damp cloth. (I don't know how strictly necessary this is, but my mum always does it "in case it's dusty in the factory"). 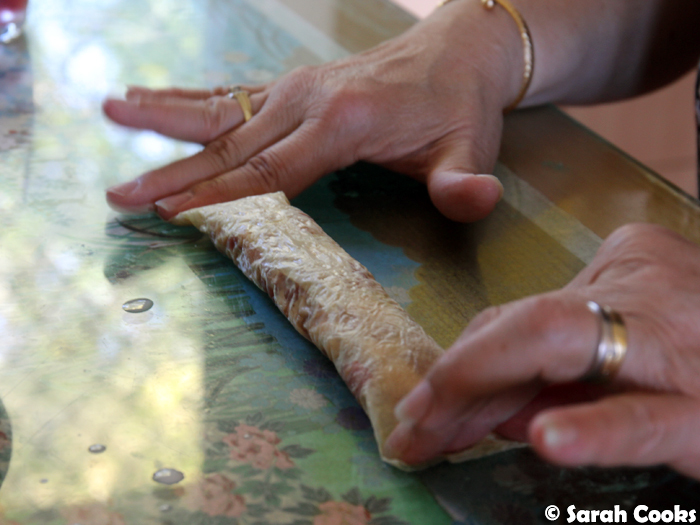 Place the piece of piece of bean curd skin on the work surface with the long side facing you. 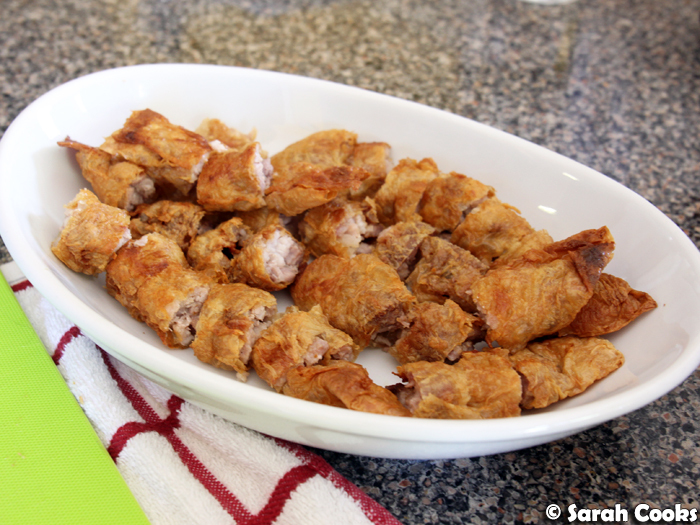 Place a strip of the pork mixture horizontally on the bean curd. (See the picture in the post). Use your fingers to dab some of the cornflour mixture on the vertical edges of the bean curd skin, and on the horizontal side furthest away from you. 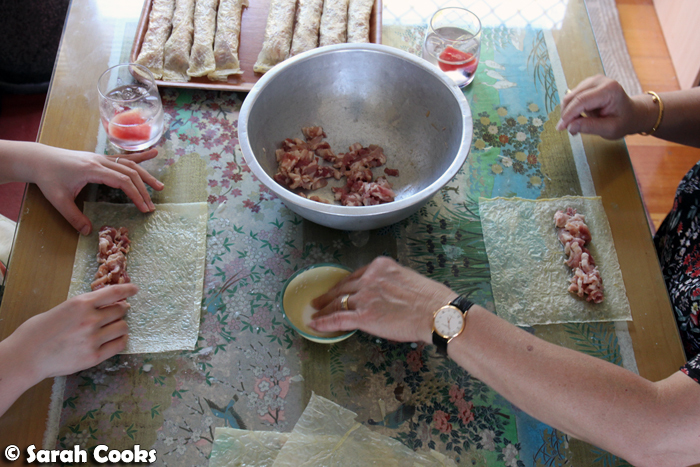 Roll up the loh bak as tightly as you can manage, and then press down on the edges to seal. Place the rolled up loh-bak on a tray, seam side down. Continue with the remaining pork and beancurd until it is all gone. (We usually have a couple of pieces of bean curd skin left over, this depends on the size of the pork belly you buy, don't panic). At this stage, you can loosely cover the loh bak with clingfilm and refrigerate for a few hours or up to overnight, until it's time to fry. Heat up vegetable oil in a wok over a medium heat. (You'll need enough oil to allow the loh bak pieces to float freely). Once the oil is hot, fry the loh bak logs in batches, until golden brown on the outside and cooked through. Drain on paper towel. 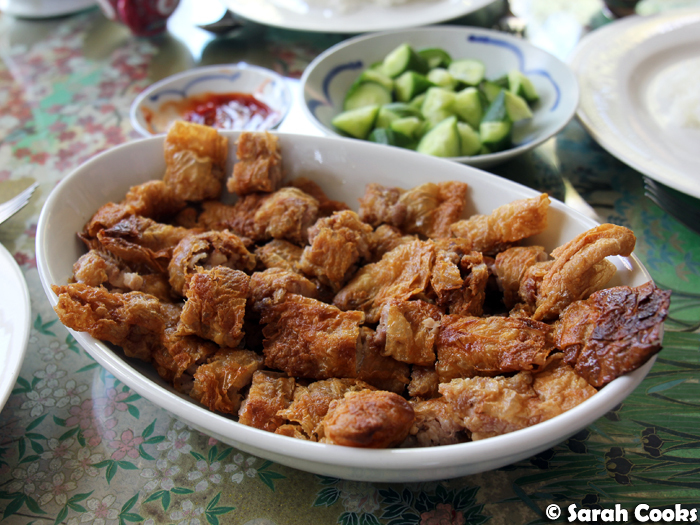 Once they're all cooked, cut the loh bak logs into 2-cm chunks and place on a serving plate. Make a dipping sauce by mixing equal quantities of tomato ketchup and Lingham's chilli sauce and adding a teaspoon or so of toasted sesame seeds. Awwww love Asian freestyle measurements! Except it's so meaningless when you're trying to learn! My mum wipes the bean curd sheets too before wrapping. Was told that will moist the sheets for easy wrapping and prevent it from breaking. Instead of deep frying straight, my family steam it 1st before deep frying and freeze the extra after steamed. Oh. This reciple is so good for me!